While a trip to the wonderful Scottish Rite Theater is not on the 2017 Austin Summer Fun Checklist for Kids, catching a Too Many Stories! show is a great bonus summer event. Entertainment and air conditioning.... what more could you ask for? 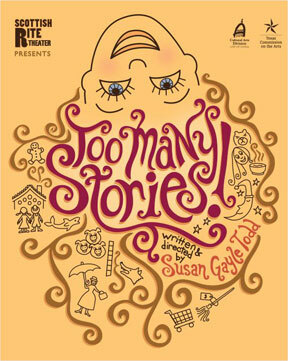 What is Too Many Stories! About? Kallie catches Sam and Bogus getting away with loot they’ve stolen from a department store. With the help of the kids in the Scottish Rite Theater audience, a smart little girl outwits and exhausts the bad guys through story, music, and improvisation. All ages. Too Many Stories! is a Scottish Rite favorite, back by popular demand for weekday matinees in summer 2017. Cost: $6 for adults and children (children under 2 are free). Purchase Tickets in advance or at the door.